This quiet and beautiful movie deals with the aftermath of WWI in France in a way I haven’t seen before. 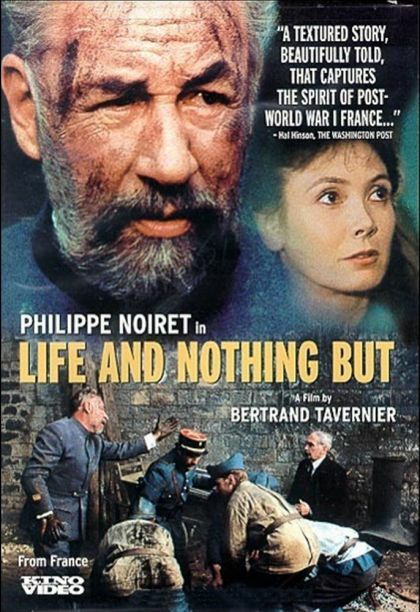 Life and nothing but aka La vie et rien d’autre is set in France, in 1920. The landscape is destroyed. The villages are in ruins. 350’000 men are missing. 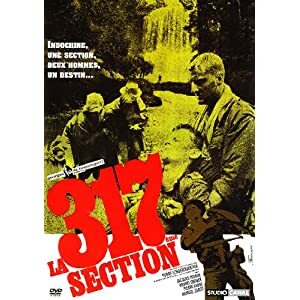 Major Dellaplane (Philippe Noiret) is working in some sort of army hospital trying to find the missing soldiers. He analyses features and descriptions, looks at those who are so badly wounded that nobody would recognize them, looks at those who have gone deaf, blind or crazy and also at dead bodies. He has them drawn and measured and puts their portraits in huge albums. So far he has found maybe 50’000 soldiers but there isn’t a lot of hope of finding the remaining ones. Into this mess comes Irène de Courtil (Sabine Azéma), the wife of a missing officer and member of the French high society, part of those who are responsible for this monstrous war. Irène is looking for her husband. Not so much, it seems, because she wants to see him again but because she wants to move on. Her memory of him is almost faded and they were not married for very long either. Dellaplane treats her very unkindly and tells her that her husband is only one out of 350 000 missing men. In other words, he couldn’t care less about one individual person. She leaves the hospital and tries other places but much has changed, addresses do no longer exist. She meets Dellaplane again in various other places. When she hears that there is a site in which they display the belongings of dead soldiers, she travels there to try to find something that belonged to her probably dead husband. Dellaplane is there as well. Every time they speak, they quarrel and shout at each other but they also start to understand each other’s positions. Dellaplane feels pity and promises her to help her husband’s body. While this is happening, there is a second story line. General Villerieux has to find bodies of anonymous dead French soldiers. One of them should be picked and buried under the Arc de Triomphe in Paris. It proves to be very difficult as there are as many dead German and American soldiers in this region as there are French ones. The earth is saturated with dead bodies. 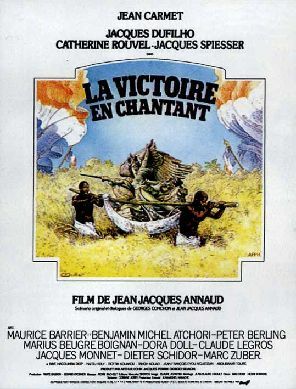 Plus there were the Senegalese troops. Despite their being French, the government doesn’t want to bury an African soldier or one from another colony. As easily as these are ruled out, for obvious reasons, as difficult it is to make a difference between American and French soldiers. The idea of the tomb for the Unknown Soldier infuriates Dellaplane and he doesn’t help his superior. He thinks it is cynical and belittles the losses. 1’500’000 dead French soldiers shouldn’t be represented by one anonymous figure. There are other important story lines in the film. One follows a sculptor who is making monuments for the villages. Each and every village wants a monument for their fallen. La vie et rien d’autre is beautiful but also bleak. It’s raining constantly, there are accidents with mines that go off, the places are swarming with hopeless people looking for their loved ones. Everything is in ruins. Everything seems so senseless. The destruction, the deaths, the suffering. I liked this movie a great deal. It’s also a touching love story. What I liked best is the fact, that it starts where most other movies end. After we have seen the last dead soldier fall on the battle field, WWI movies usually end. I recently finished the mini-series ANZACS and watched this right after. I’m glad I did as the contrast is amazing. As much as the Australians, Canadians and Americans sacrificed, they returned to their countries, countries that had not been touched by war. They lost a lot of young men, but they didn’t have to cope with a war-ravaged country and destroyed cities. I think this shouldn’t be forgotten. Unfortunately there was no English trailer but the French one will also help you decide whether you should track it down or not.